DLI stands for Direct Liquid Injection. This is a vaporization technology firstly developed to vaporize chemical precursor with a low vapor pressure. In the direct liquid injection the precursor container and the vaporizer are two separated parts. The precursor container always remains at room temperature. 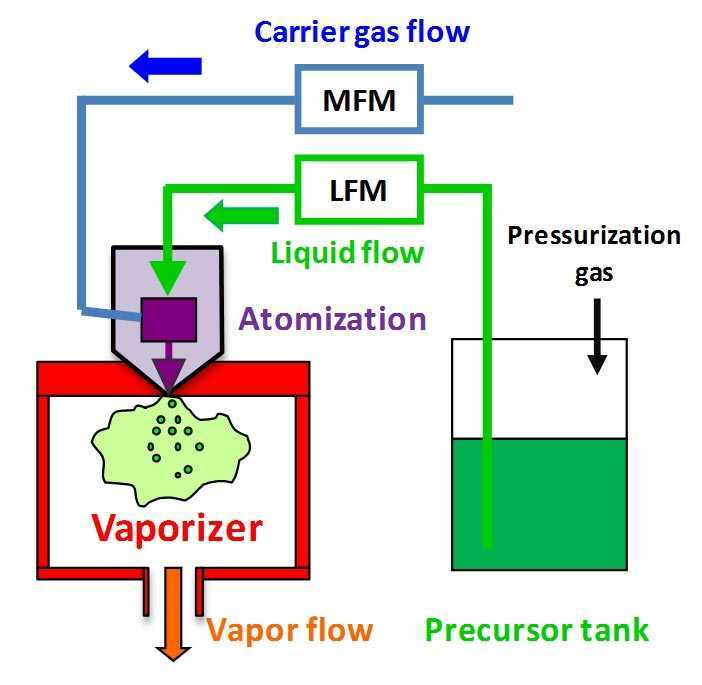 The vaporizer is heated and the carrier gas flow is delivered in the vaporizer with the liquid or solution flow. The quantity of liquid or solution injected/delivered per unit time in the vaporizer is only what is required per unit time for the process. The chemical precursor remains at room temperature as long as it is not required to be vaporized for the process. DLI vaporizers can handle both liquid and solid ALD and CVD precursors. Solid precursors need to be dissolved in an organic solvent. The technology is a particularly well suited method for low vapor pressure and poorly thermally stable liquid or solid ALD and CVD precursors.